The importance of a great concert hall to Newark cannot be exaggerated if the city is to be taken seriously as a major music center. This concept has applied to Newark from earliest times, from the building of the Mosque Theatre in the 1920s to the opening last weekend of the New Jersey Performing Arts Center. A half-dozen performing halls were built in the city, beginning in the 1840s. Early on, churches, schools and an occasional hotel lobby served the same purpose. At first, churches provided an ideal location for performing sacred music. Newly installed pipe organs at Trinity, Grace, Old First and other churches were perfect for performing recently composed organ works. Newark's private schools also were good spots for teaching a new dance step to music, or for performing chamber music. More than one hotel lobby provided an excellent location for a review of a new musical composition. With the arrival of 19th-century classical music, better facilities were demanded. This led to the emergence of a number of new performing facilities. Newark's first real concert hall opened in 1847 at Market and Harrison (Halsey) streets, named Concert Hall. This was a dramatic building, one of the city's first to be illuminated by gas. It had a very large stage with a drop curtain. Soon it was taken over by professional theater people, and musical performances lost out to dramatic renditions. Later, its name was changed to the Newark Theatre. In 1848, Library Hall on Market Street opened. 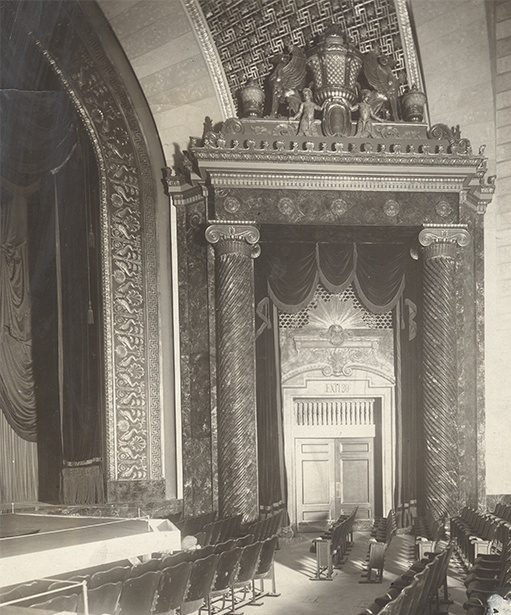 Known for its auditorium, which seated 600, it soon became Newark's best concert hall. In 1873, the former Park Presbyterian Church on West Park Street was converted into a music hall. Its first concert was sponsored by the Newark Musical Union. The building is perhaps best known as an early home of the Newark Public Library, which was housed there from 1889 to 1901. Later, it became the home of the New Jersey Historical Society. In 1876, the New Institute Hall, located on lower (southern) Washington Street, emerged from the old Newark Industrial Institute. J. Leonard Gray opened the new musical facility in September 1876. For a long time, it served as a major musical center visited by hosts of famous pianists, singers, orchestras and bands. 'But here, too, the drama came and drove out the musicians,' a newsman reported. As in previous instances, musical concerts were gradually forced out of their performing spaces by the very dominant theater groups. Radio, television and the movies had not yet been invented. Theater, along with reading, was the major form of entertainment for most people. In 1881, the Young Men's Christian Association of Clinton Street was rebuilt and opened as Association Hall. It was a good location for small musical groups, and one of the best was the Newark Madrigal Club. In 1893, the Essex Land Company remodeled a Clinton Street church, then opened the Essex Lyceum in January 1894. The Union and Essex buildings now occupy that spot, which became the first site of Essex County College in the 1960s. The year 1885 marked the opening of one of Newark's most important concert halls—the Krueger Auditorium. It was indeed 'one of the most nostalgic links to Newark's past.' Built by Gottfried Krueger, founder of the Krueger Brewing Co. in the German section of Newark, it later became a center for the city's social and intellectual life. At first it was frequented by the city's famous German singing societies and was first known as Saenger Hall, but after an 1894 fire, it was rebuilt and renamed for Krueger. The interior was three stories high, surrounded by private boxes. Three tremendous crystal chandeliers hung from the ceiling, and the tops of each box contained niches with busts of renowned poets and musicians. Surrounding the main ballroom were smaller banquet and party rooms, and several public and private bars. During its glory days, Krueger Hall saw Woodrow Wilson campaign for New Jersey governor, Jacob Haussling run for mayor, and Presidents Taft, Cleveland, Roosevelt and Wilson as well as William Jennings Bryant come to dinner. Its decline began with the construction of the Robert Treat Hotel and the Newark Athletic Club (later the Military Park Hotel). Its death knell came with the passage of Prohibition. While Krueger Hall's revival almost occurred with the repeal of Prohibition, the damage was done and the end inevitable. Newark's German-Americans were leaving the Clinton Hill section, as was the excitement once generated by the concert hall and its accompanying beer garden and restaurants. For nearly 175 years, Newarkers and northern New Jerseyans have attended functions at concert halls in rebuilt skating rinks, churches or refabricated commercial buildings. In some instances, new buildings were constructed to accommodate a favorite musical group, only to be pushed out by a successful theater troupe. Yet deep down, there has always been a need for the construction of a great new concert hall that could accommodate large and small musical performances. In 1926, Charm magazine, the handsome publication of Bamberger's department store, stated 'that New Jersey has no Metropolitan House or Carnegie Hall, where lovers of music may go nightly to worship at the feet of the great living masters—Scotti, Zimbalist, Paderewski. Nor has New Jersey any permanent building of which it may be said: This is a shrine dedicated to the adoration of music.' Well, the dream did come true with the construction of the Mosque, later Newark Symphony Hall. For more than 50 years, the south end of Broad Street has had a concert hall equal to the best in the nation. Now, however, a powerful new establishment has arrived in Newark, yet another 'temple to the adoration of music' and the performing arts. With the inauguration of the glamorous New Jersey Performing Arts Center, Newark, like New York, will have two cultural centers, the NJPAC and Newark Symphony Hall, just as New York has Lincoln Center and Carnegie Hall. Newark Symphony Hall was built by the Shriners as the Mosque. The members wanted a home in downtown Newark for their rites and financial affairs. Built in the 1920s, it cost more than $2 million, proving to be a financial encumbrance from the very start. Hard times, and the press for more movie houses, resulted in its partial conversion into a movie house as well as its functioning as a concert hall. As a movie palace, it was billed as a 'Palace of Enchantment.' Like the stage show at Rockefeller Center, its fare included not only the latest Hollywood hits but ballet, vaudeville, stand-up comedy and an organ serenade. In 1965, it was purchased from the former owners for $240,000, and for the first time since the death of philanthropist Mrs. Parker O. Griffith in 1958, again became the home of great musical concerts. Recently, the New Jersey Symphony Orchestra played its last scheduled concert there, before moving its home to the New Jersey Performing Arts Center. At this point, a new chapter waits to be written for the grand old lady of South Broad Street. Hopefully, she will emerge as elegant as ever when she takes on new life.